Meet our latest Carolina Art Crush, Aspen Hochhalter. 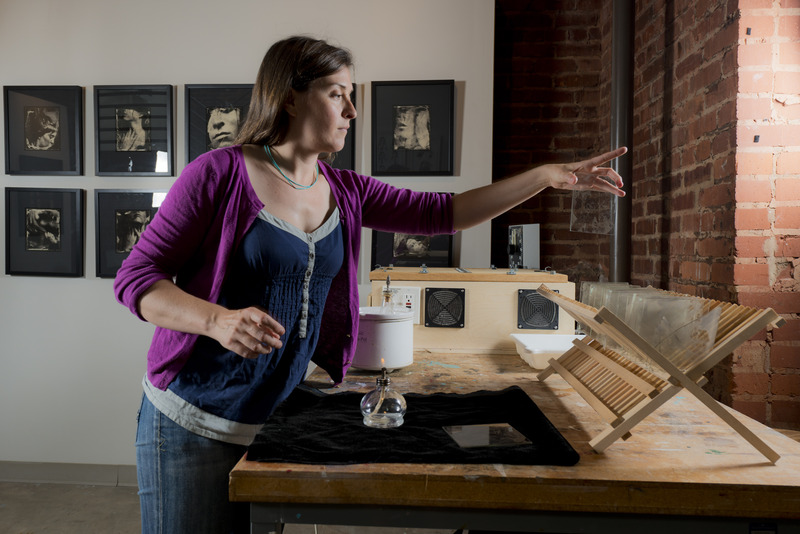 Aspen earned her BFA in Photography from Creighton University in Omaha, Nebraska and her MFA in Photo-based Media from East Carolina University in Greenville, NC. Since 2007, Aspen has worked at the UNC Charlotte College of Arts + Architecture as an Associate Professor of Art and the Photography Area Coordinator. Aspen’s current bodies of work combine both old and new photographic techniques. We just can’t wait to see her current exhibition opening this Thursday, October 2 at Pease Gallery at Central Piedmont Community College. 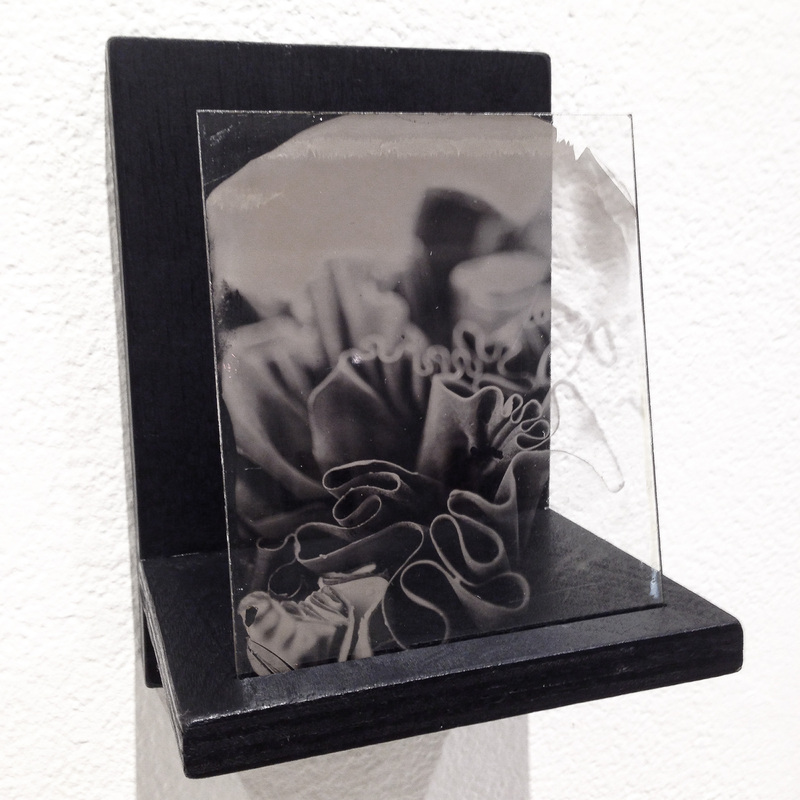 Objects in Perspective presents Aspen’s recent collaboration with another Charlotte-based artist, Natalie Abrams. If you can’t make the opening, don’t worry: Aspen will be giving a lecture in Pease Auditorium on October 9 at 3pm. AH: This is a hard question. My initial gut reaction is to say, “Hides [her] crazy well” but I don’t necessarily need people thinking I’m crazy. And that’s four words. AH: Actually, my students inspire me quite a bit! They always amaze me with their dedication, imagination, and willingness to put themselves out there. I feel so lucky that they’re willing to take risks everyday, not to mention trust me enough to listen to what I have to say! They are doing work that is way beyond what I was doing at that stage in my life. Watch for them, there’s a good contingent of UNC-Charlotte art alumni that are on the rise! AH: I am continuing a body of work started a couple of years ago. I must make my bones began as a collaborative project between myself and Melissa Word, a professional modern dancer and choreographer. The first part of the project focused on translating the fluidity of time-based gestures and movements of dance into still photographs. The project is inspired by an Italian proverb, devo farmi le ossa, which translates, I need to make my bones, a phrase that I believe resonates with many people during our current cultural climate of upheaval, financial collapse, and political uncertainty. People are finding strength to reinvent themselves and survive in the midst of a major cultural shift; I must make my bones is a sentiment filled with the promise of growth and resilience. 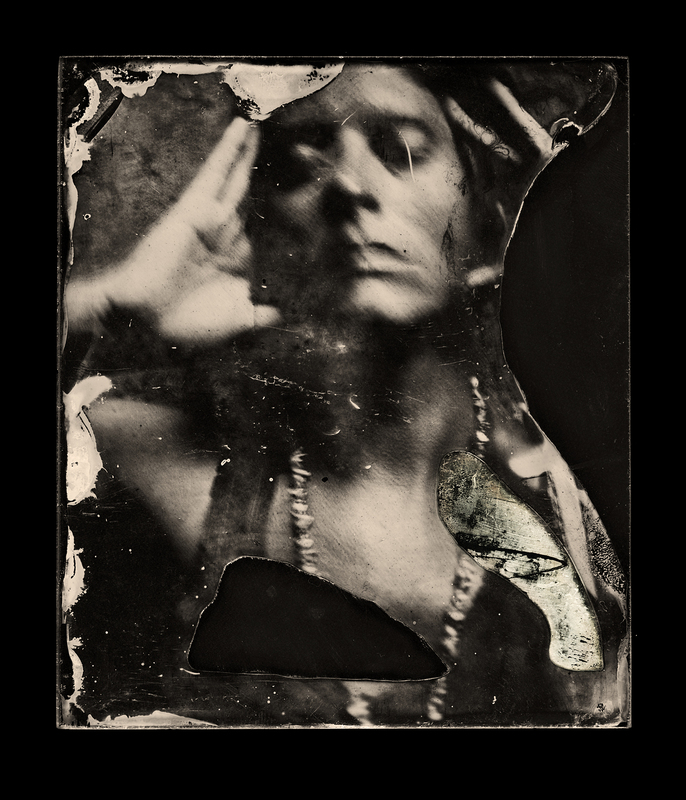 The still images are gum bichromate prints—another historic photographic process—pigmented with the ash of burned objects such as human hair and found photographs (family snapshots from the first half of the twentieth century). The still images find physical form through the ash and symbolic strength through the burned object’s emotional resonance. Some of the images that emerge from the ash are ephemeral and lack solidity, others are strong in their form. Both the hesitancy and strength represented in these images pay tribute to the courage of making one’s bones, as well as the enormity and complexity of the task. 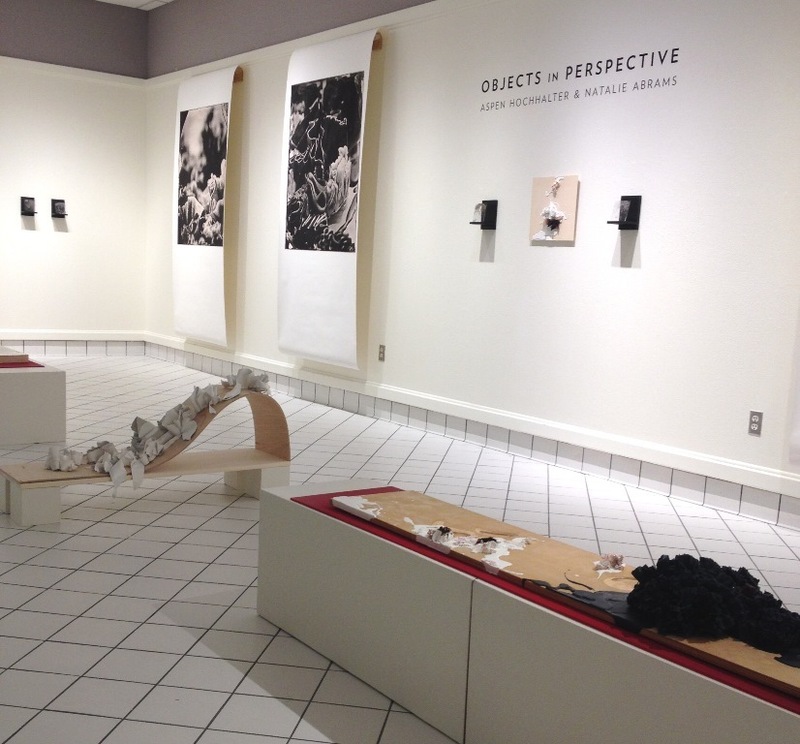 AH: Natalie Abrams and I are currently having an exhibition of our collaborative project, Objects in Perspective, at the Pease Gallery at CPCC. Natalie and I met at the McColl Center for Visual Art + Innovation last summer during our residencies. 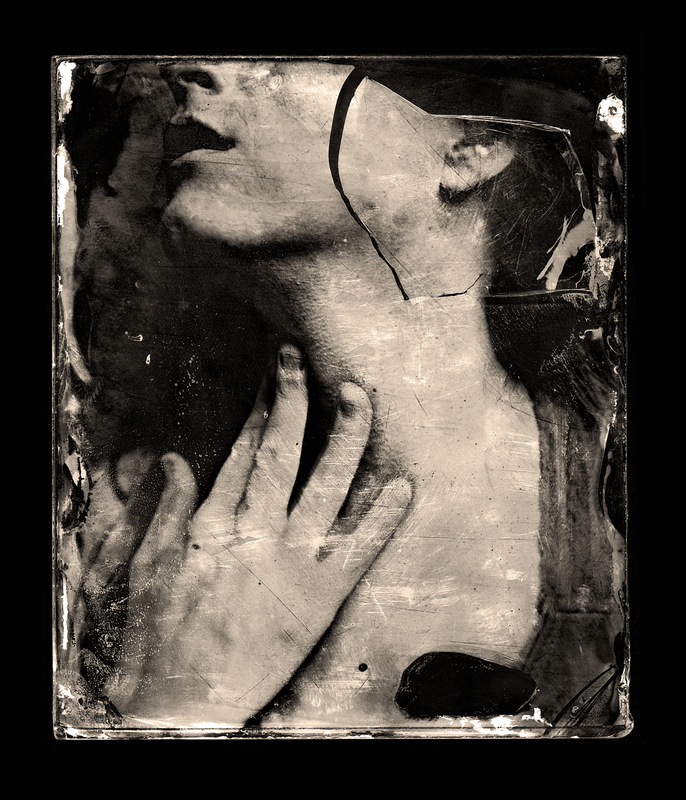 One of the main photographic processes I’m using these days is one of the very first invented in the mid 1800’s, wet plate collodion. It is a labor-intensive process involving lots of intense chemicals. There is an immediacy to this process that is wonderful; since you have to coat, expose, and develop wet plates all within a short period of time (about five to ten minutes depending upon the heat and humidity) there is a somewhat instant gratification to the whole process. That immediacy, in an odd way, parallels digital processes in my mind, however the process as a whole is a practice in patience and dedication, so many things can go wrong and much of the time it does! 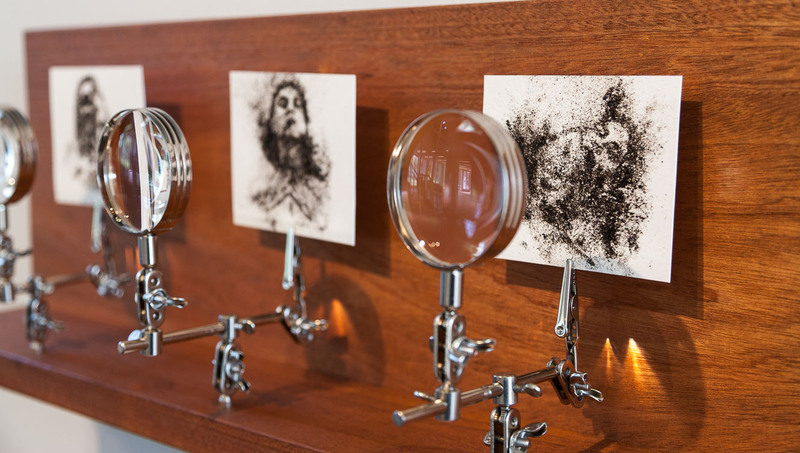 The exhibition features my wet plate collodion photographs of Abram’s sculptural pieces. She utilizes wax and recycled/reclaimed latex paint to create beautiful ribbons of material. 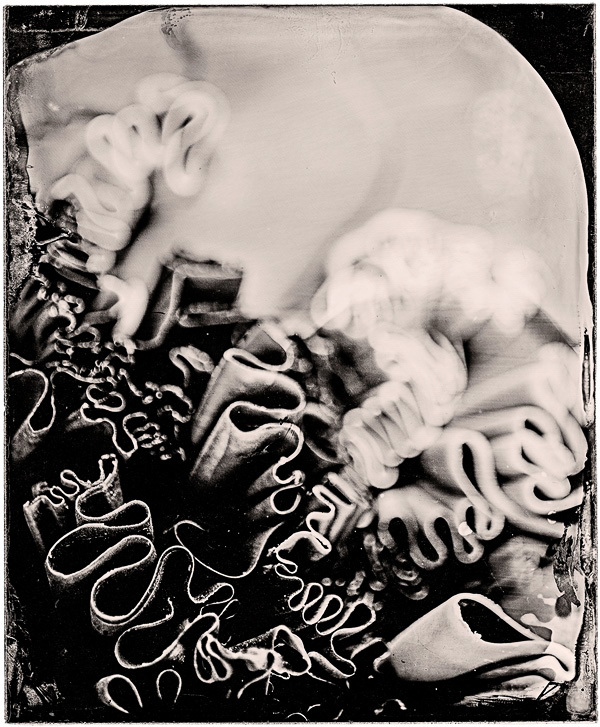 The close-up photographs of the wax transformed the objects into abstract landscapes, reminiscent of the ocean floor. The plates were then scanned and enlarged into huge banner size images. In the exhibition, both the plates and enlargements are exhibited. There is a reception on Thursday, October 2nd from 5-7 pm, and the show will be up through November 6th. AH: The Castell Photography Gallery in Asheville, NC is not only one of the few galleries in the Carolinas focused on contemporary photography; the gallery also exhibits some of the most innovative, experimental photography being produced in the country! This is a gallery Charlotteans should definitely get to know! AH: One of my students gave me The Alchemist to re-read, and this summer I visited Scotland and became obsessed, so basically many, many books about Scotland! 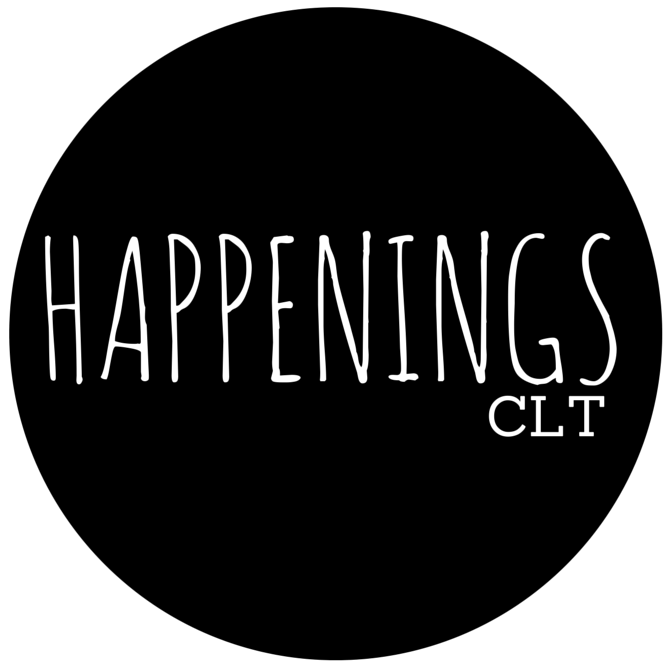 HCLT: What is your number one art piece/place/event in Charlotte? AH: I truly appreciate the innovative performance experiences the Triptych Collective has been pursuing for the last couple of years. I have had the good fortune to know (and work with) many of the dancers and witness their fearlessness in developing projects and intentionally finding non-dance oriented spaces in which to perform. They are pushing boundaries and challenging our community in wonderful ways! AH: Hmm, I just had an awesome Carolina Dog at Brooks Sandwich Shop in NoDa—one of my favorite spots in Charlotte, it is so southern and quirky, it opens early but closes by mid-afternoon. You’ll see business men, cops, blue collar workers, NoDa locals all eating their burgers and fries outside –such an interesting spectrum of people…it’s fantastic! And their chilidog with coleslaw just hits the spot! 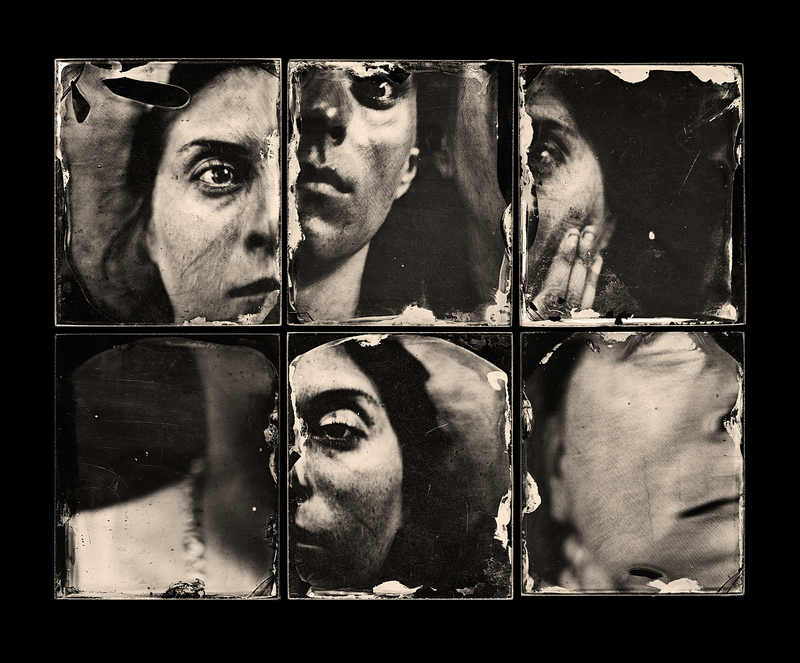 AH: In the next couple weeks I will be leading a Lith printing workshop at CPCC and then traveling to Greenville, NC to the Society for Photographic Education Southeast Regional Conference to lead a Lith workshop there as well! Lith printing is an interesting, experimental darkroom process that produces a print with beautiful, warm highlights with harsh gritty shadows. The technique will be fun for people who have worked in the darkroom before because the workflow is completely opposite of the usual procedure: exposure controls contrast, development controls shadow detail and a willingness to sit in the darkroom over a tray of chemistry and watch a print develop for 10, 15 or even 30 minutes! The results are well worth it! If you find this as intriguing as we do, sign up for the Lith workshop! We’ll be there! Please note: It is preferred for participants to have previous darkroom experience and participants must bring full tonal range negatives of a variety of subject matter (35 or 120mm). CPCC will provide all materials necessary for production. The workshop is $20 for students and $35 for non-students. To sign up, please email Grace Cote, Art Gallery Coordinator, at grace.cote@cpcc.edu. Payment is only accepted in cash or check.